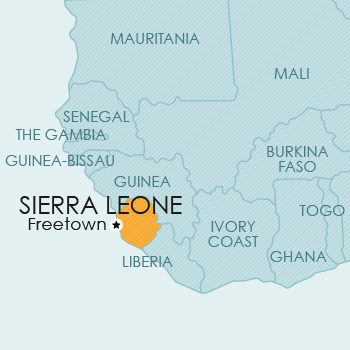 The Republic of Sierra Leone is located on the Atlantic Ocean, on the west coast of Africa. It is situated between Guinea to the north and east, and Liberia to the south. Sierra Leone is a member of the Paris Convention, the Madrid Agreement and Protocol, and the WTO/TRIPS. Provision is made for the registration of trade marks for goods, for series marks and for parts of marks. Although Sierra Leone is a member of the Paris Convention and the Madrid Agreement, it has not passed national legislation giving effect to these treaties; it is therefore not clear whether it will be possible to claim priority in terms of the Paris Convention or enforce international registrations in terms of the Madrid Agreement. There is no specific provision for defensive marks. Sierra Leone is a member of the Paris Convention, ARIPO (Harare Protocol), the PCT and the WTO/TRIPS. Patent protection is available by way of the confirmation of a granted UK or EP/UK patent, or via an ARIPO application designating Sierra Leone. Sierra Leone has not implemented the Harare Protocol (which regulates patent and design filings in ARIPO) in its national law. Accordingly, it is not clear whether patents granted by the ARIPO Patent Office will be enforceable in Sierra Leone. Although the Registrar is currently accepting PCT national phase applications, the national laws of Sierra Leone have not been amended to provide for the PCT. Accordingly, the Registrar is not processing the applications to grant, as the draft Bill which incorporates the filing of PCT applications has not yet passed into law. Sierra Leone is a member of the Paris Convention, the ARIPO (Harare Protocol), and the WTO/TRIPS. A United Kingdom design extends automatically to Sierra Leone. Registered design protection in Sierra Leone is also obtainable via ARIPO. Since Sierra Leone has not implemented the Harare Protocol (which regulates patent and design filings in ARIPO) in its national laws, it is not clear whether ARIPO design registrations would be enforceable in Sierra Leone. There is no national route for obtaining registered design protection in Sierra Leone. Sierra Leone is not a member of the Berne Convention. In Sierra Leone, although a Copyright Act was enacted in 1965, it was not possible, at the time of writing, to obtain a copy of the Sierra Leone Copyright Act. As indicated above, Sierra Leone has not yet acceded to the Berne Convention. Accordingly, no commentary on copyright could be given at the time of writing. Currently, no legislative provision for plant breeders’ rights or other sui generis protection for plants is available in Sierra Leone.